If you are searching for the Free Google Adsense WordPress theme with SEO-friendly features, then you are in the right place. We have been in the Blogging and WordPress industry for the past eight years, and hence, we know that the Adsense is one of the best monetization methods for the WordPress blogs. Thus, we have designed an exclusive Adsense optimized WordPress theme and launched on the grand theme marketplace, ThemeForest. It’s Admania – High CTR WordPress Template. However, we’ve realized that the beginners may not be able to allocate a budget for the site design and hence they would need the “Free WordPress Adsense Theme” to include the Ads at the highly-clickable areas. 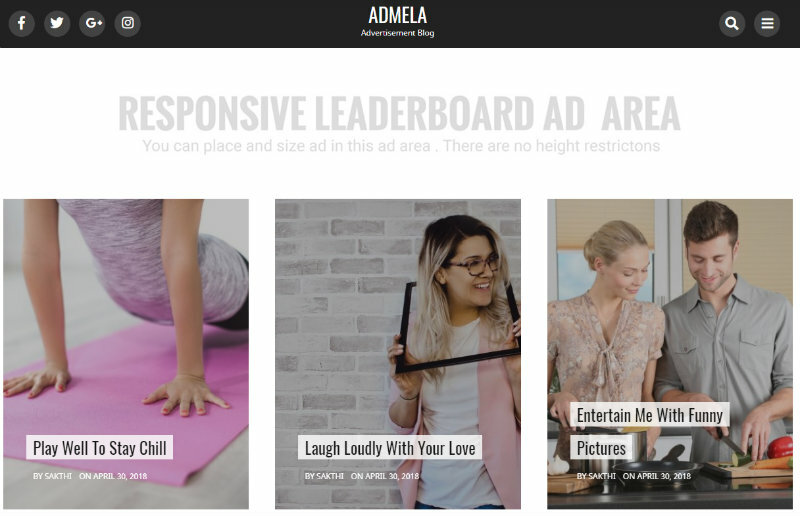 So, we have carefully made a free WordPress theme, Admela with Ad spaces and contributed to the WordPress themes repository. Yes! You can download this advertisement theme for free and boost your Adsense and affiliate earnings! As this Adsense optimized WordPress theme has flexible settings, you can use it without any difficulty. Now, let’s have a look at the features of the Admela WordPress theme! 1. Ad Placements – You can integrate the Google Adsense and affiliate banners at the high CTR places like header, in-between and at the end of the Homepage content. 2. Coding Standard – We have done the design with clean and standard codes with HTML 5 and CSS3 Validation. 3. Responsive Design – The free Ad theme is 100% responsive and looks fit on all the gadgets like PC, smartphone, and tablets. 4. Attractive Slider – Having the nice-looking slider section to grab the readers’ attention is a prominent quality of the theme. 5. SEO Optimized – The free Adsense ready WordPress theme supports the SEO features like Schema.org, fast loading, and tested with Google Structured data. 6. Social Share Buttons – The social sharing is integrated, and hence, you don’t need to install a plugin to get the social shares. 7. Browser Compatibility – As we are more professional, we have built this free ad-friendly theme with the perfect browser compatibility to support all the web browsers. 8. Support – If you face any issues, you can contact us through the support Forum. We will help you solve the troubles as early as possible. Admela is the best free WordPress theme that has Ad space for website monetization at the valid places to improve your Click through rates. I’m sure that you will get the better placement for your ads and hence it is more likely to increase your Adsense earning. Just give a try to this free Advertising WordPress theme and enlarge your revenue through the Ads of your WordPress site/blog. So, what do you think about this best free WordPress theme for Adsense? Would you like to download the free version of Admela? Leave your thoughts in the comment section.